Japan had an earthquake, tsunami and a very bad nuclear accident, with the loss of ten to thirty thousand lives. There has been no mention of possible U. S. insurance claim involvement for Buffet and AIG. Then we have the Euro, a currency renown for its flatulence. The European Central Bank is going to save the European Union,---from what, they’re not quite sure of at this point. It depends on which country you live in. The Middle East has people rising up and demanding an end to the tyranny. Our newspapers Stateside, translate that as a demand for Democracy. Where is their middle class, the necessary ingredient for a stable Democracy? Gee, they don’t have one, just a few rich people and a hell of a lot of poor people (that want to be rich). I’m glad to see Obama finally going after the pirates attacking our shipping. Unfortunately he got his countries mixed up. Somalia, not Libya is where all the hostages are. Thomas Jefferson already did Libya. The UN’s effort to make Libya a “No Fly Zone” is admirable. I hope they include Fruit flies along with House Flies. God bless these UN health initiatives. Kidding aside, getting rid of the present regime will not solve any of Libya’s present social unrest, and it will acerbate survival for many in the country. The UN lost points on this. The Arabs are more into religion than material wealth, and they will remember what the UN (the Christians) did to an Arab brother. At home, there is a hiring freeze on all new government employees. And if Congress fails to keep on passing one of these temporary budgets every two to three weeks, the Federal Government won’t be able to meet payroll. Government employees are anywhere from 3 weeks to one day away from being layed off. It depends on how close it is to payday. Come Friday, if they tell you not to come to work Monday, you can’t whine about not being paid a week later, now can you? Our dollar is buying less gas, food and utilities, and that's just not world news. Of course, if you live in the Middle East, you may beg to differ. Bernanke’s inflationary policy is changing the world. Everyone’s currency is buying less. In the US, we cut cable and the extra vacation. In the Middle East, it’s the amount of food on the table that gets cut. The real news in the world is not about a move towards Democracy, it is revolt against perceived injustice. There is a lot of anger out there. It’s in Wisconsin, Egypt, California, Libya, Illinois, Tunisia, Nevada, Mexico and Florida to name a few. I’m thinking of discontinuing the newspaper, not much in it any more. The depression is over, we’ve licked inflation, the national debt is no longer a problem and stocks are bouncing off of new highs. So when we do the math, the minimum wage worker has had a 20% haircut. In the span of a year, that is a loss of $4,800 in buying power. You get the same paycheck; it just doesn’t go quite as far. The well off person with 100K in the bank has lost 20K in buying power. Of course, that really isn’t perceived by the saver, he can get the cash and dance all over the bedroom throwing 100k in one dollar bills everywhere. The concept that his savings have somehow decreased is not at all obvious, after all he still has every dollar. PIMCO dumps all of their Treasury bond holdings? I wonder what they replaced it with, gold, silver, oil?? It seems the message here, is if you have cash, don’t loan it out for peanuts, rates are going to have to go higher. Student loans could be the goose laying golden eggs. A student with 200k in debt at a future 12% interest rate, amounts to slavery. Of course, how could interest rates ever get that high??? With all of the real estate “under water,” picture Bernanke in a boat named “The Economy” drilling a hole in the bottom of it--to correct this mess. 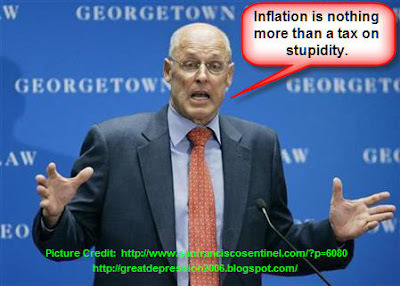 That’s what inflation is all about, the boat is sinking---contrary to popular belief, the water isn’t rising. It will be different this time. All of the people we blamed for the last depression are dead. I think we can excuse them for dying, it wasn’t a planned event. This is a reprint of something I wrote back in May of 2008. It's dated, but things haven't changed much, except for administrations. Hopefully I'll have a new post by Thursday. The government and Congress are going to save Bear Stearns, Countrywide, give everyone who paid taxes $600 dollars and keep the economy out of a recession. You know they mean well, but maybe just doing nothing might be a better approach. My only question is this; whose money are they going to do it with? Don't they have to tax people to raise the cash? We are going to poorhouse in an air conditioned limo! Forget the hand basket to hell, that’s step two (when YOUR healthcare runs out). The real issue here is that the solution can result in a bigger problem. Note also, the people with solutions for everything, are usually part of the problem. Time is the only true test. The real estate market may seem to be just one issue, but it is intertwined with the banking system, the economy, Wall Street and government. Change one program and everything else moves in some unintended way. It's a little like taking Viagra, only to have your hemorrhoids swell up. You knew what you had in mind, and it certainly didn't involve a lot of pain! Our Government works, almost in the same manner.